Post Commander of Tactical Command Task Force of Border Security RI-PNG Yonif Mechanical 512 / QY in addition to performing the main tasks as a taskforce pamtas also active in Social Communication activities with all components of the community Senggi District, Keerom Regency, Saturday (11/04/2017). 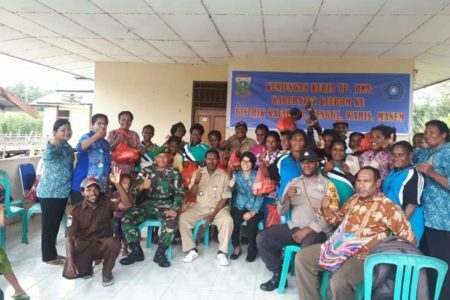 That day was evidenced at the time of the working visit of the mother of PKK Head of Keerom Regency, the mother of Fransiska Ni Made Santun Watae in Usku Village of Senggi District of Keerom Regency, 8 (Eight) Personnel Satgas Pamtas RI-PNG Yonif Mechanical 512 / QY led by Captain Chk Bahrudin, SH directly attend and participate to support / assist the activities of the working visit of the head of the PKK Keerom masters. On the same occasion Captain Chk Bahrudin, S.H. In front of the PKK group and elements of the Kampung Usku community in Senggi district, Keerom district gave an explanation of the importance of PKK organizations at the village level up to the district level. Mrs. Drs. Celsius Watae, M.H. as the leader of the PKK of Keerom regency, the PKK Movement is a community institution that has been acknowledged by the world body and is also one of the most mature organizations in the Keerom district of Papua province. The head of the PKK of Keerom also explained about the ideals of PKK as listed in the 10 main programs of PKK which have the aim to empower families in improving the prosperity of the inner and inwardly to the realization of a Happy Culture family prosperous Self and live in a harmonious atmosphere which in landed with faith and devotion to God Almighty. On the sidelines of the activities of the head of PKK mobilizer also menyaksikaan handicraft PIRING LIDI results from the group PKK / Dasa homes Mambrub Kampung Usku and also provide basic food aid to all the people who attended the activities in the office PKK Kampung Usku Senggi district Keerom district.